Did you all have a nice weekend? Remember how I said Brandon had plans to get stuff done around the house, well that is exactly what we did. Mostly I just painted the office and while it was literally the last thing I wanted to do on my Saturday/Sunday, I am thankful because I finally convinced Brandon that I need the office more than his Michigan gear needed it. We aren’t close to being finished with it, but it’s a start. No more blogging from my bed every night! As far as fun goes, this weekend was definitely limited on that. Such a gorgeous dress! Happy Monday! Beautiful! I agree, this is a fabulous floral print. Crisp & totally refreshing. As always, the backless looks incredible on you. Hope you had a wonderful weekend, Shannon! Well if this dress wasn't just made for you! So crisp and clean looking which is literally your entire wardrobe. Totally fits you! The back of this dress is amazing!! Sunning dress, I love the open back and floral print! What a gorgeous find. It goes so well with the yellow purse too! That dress is amazing and I love the color of the bag with it! Love back opening of your dress!! LOVE the back of this dress, and I'm sure the maxi dress is just as cute. Perfect for spring! Lovely dress, I just cannot skip wearing a bra. I love the keyhole back, just need a little more coverage to be able to wear a bra. Ummm yeah I can see why you needed that dress. I mean, it's beautiful and that back is like WOAH!!!!!!!! Love the feminine detailing on this dress. I may have to get the maxi version! You look so beautiful and feminine in this dress. I love the print! Luxurious dress, incredibly beautiful woman 🙂 Keep it up! Seriously I LOVE your style! Gorgeous colors here. That dress is perfect for spring and looks amazing on you! I love the open back! Just found your blog girl, and LOVE LOVE the concept and idea. Your scheme and layout is BOMB. This dress is f'ing gorgeous, with the yellow purse I love. So glad to be connected! Beautiful dress! 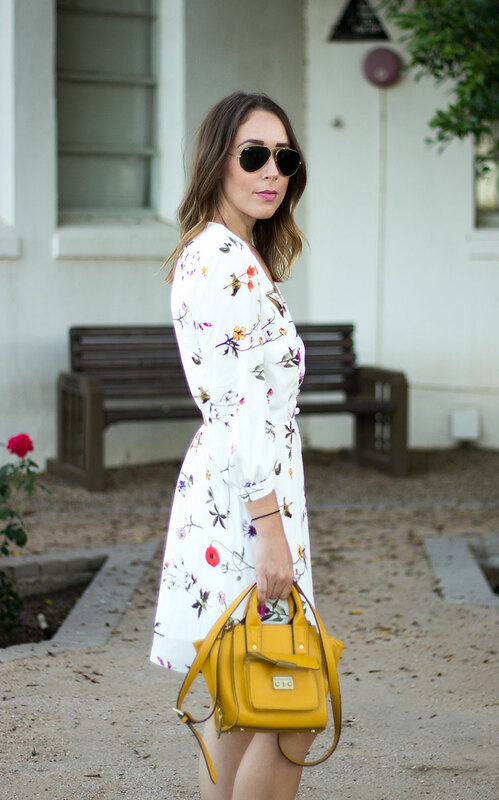 Such a gorgeous floral print and love it with the yellow bag! Wishing you a great week lady! That dress is perfect for Spring! I love the bag you paired with it as well! OMG this dress is stunning!!! Such a pretty print, and I love the back cutout detail! Such a gorgeous look! That floral dress is adorable! OMG I'm in love with the dress. So cute! Such a pretty dress! I love the floral print and the open back!! Such a pretty spring dress! I adore the print! Oh my, this print is so gorgeous and I'm not usually a floral person! Absolutely beautiful Shannon! I love how you styled this with those gorgeous strappy sandals and that bright yellow bag! You look fabulous as always. Super gorgeous babe, I love this look on you! What a beautiful dress! I love how simple the floral print is, it looks so chic and dainty.